Judging by the title of this post alone, you'd think it would probably have something to do with my die-hard fangirlism toward the CW's "Supernatural" television show. Fear not -- I shall not geek out about that here on Melismatic (but if you want deets regarding the Convention for the show I attended in New Jersey, feel free to ask on my Twitter). Instead, my spotlight attention for today is directed at (you guessed it) a Korean boy band (shock!) by the name of SHINee. While I'm tempted to state that five-piece boy band SHINee (pronounced "Shiny") is my third favorite boy band from the KPop genre, what with the plethora of material that I've been spinning recently just in singles alone, I would be doing them a supreme disservice. I mentioned them here once before when my fandom for them was still in its infancy, spurred on by the pop-cheesy goodness that is "Ring Ding Dong". This past Monday (or rather, Sunday night here in the USA), the group's second official album, creatively titled 'The Second Album: Lucifer', was released and it's backed by the record's first single, "Lucifer". The music video also made its debut this past week, complete with slightly shocking (and let's just say it, at times downright unfortunate) hairstyles. While overall, I was a bit letdown by the full release, especially after enduring the painfully positive fangirl hype (you'd think I'd know by now), the full album isn't too much of a dissapointment, but is decidely much more mature than their earlier material. It's also, shall we say, experimental in terms of overall sound, with the group branching out a bit more from their usual bouncing boy band aesthetic and trying new sounds and genres. The group made their formal debut just over two years ago under the SM Entertainment label with the much more r&B-influenced "Replay (Noona Is So Pretty)", which has also brought us Super Junior, BoA, Girl's Generation (SNSD) and the gods on Earth otherwise known as DBSK/TVXQ. Given that TVXQ is currently in creative limbo due to a lawsuit against SM, a sick part of me was really hoping that all of the A-Material would therefore be passed on to their up-and-coming other five-piece boyband. In some cases, this is true. "Lucifer" (the song) doesn't break many boundaries in terms of a new sonic sound for the boys, who range in age from 17 (Taemin, the one with the loooong pretty hair) to 21 (leader, Onew). Still, I've already found myself spinning it an obscene amount of times. And as I seem to do now-a-days, I shall break down my squee into bullet format. The sheer fact that this is a song called "Lucifer" by a boy band of any type makes me very happy indeed. The backbeat at times recalls a more 80's-ish sound, at times almost La Roux like. No, it was not just your ears. One of the callout hooks includes the words "Loverholic, Robotronic" in English. Amazing. There is a creepy synth go-stop stutter that is sounds a bit like a cackle subtly inserted into the chorus' background. A very keen use of metaphor in the only other real English lyric: "Her whisper is the Lucifer". For a boyband that prides itself on its synchronized choreography (loverholic, robotronic, loverholic, robotronic! ), to say I was put down by the choreography as shown in the music video was putting it mildly. Fingers crossed the live performance will be a bit more enticing. And, it just needs to be said once more -- someone really needs to talk to the stylist, don't they? Not totally unlike the boys in VFactory, I'm actually kind of proud that I don't exactly have a certain bias in this group, although after watching their Korean "reality" series Hello Baby in which they take care of an adorably precocious toddler (that I kind of want to steal for my own), I've developed a bit of a crush on their humor and just how darn endearing they are as father figures (if you can really call them that, seeing as they are still children themselves, really). From the minute I first heard the group with "Ring Ding Dong", I was instantly impressed by lead singer Jonghyun's (the one driving the car and wearing the seemingly backless shirt at times -- I'm so predictable) power pipes and belting capabilities, so I suppose he would be the running favorite. But rapper Minho (the only one with a semi-normal haircut in the video -- the Caesar -- therefore making him standout more) has been well documented to be a close friend (and kind of a stalker) toward TVXQ's Shim Changmin, my personal favorite of the group. So clearly we have that in common. If "Lucifer" peaks your interest, I suggest you check out two other cuts from their most recent album. "A-Yo" is downright American sounding, like something Ne-Yo or Jason DeRulo would be releasing. Clearly, my days of delegating SHINee to my #3 KPop Boy Band are over, no matter how guilty pleasury I want to make them seem. Your move, 2AM. I'm waiting. Unnie, it's been a while since I dropped by your page. Haha. But anyways, here I am. And whoot, whoot. You beat Nikki into it. Keke. Hands down the choreo's epic. But the hairstyle? Not much. Haha. You're so right with the stylist thing. Just because it's hip, doesn't mean it's gonna work for everyone, right? 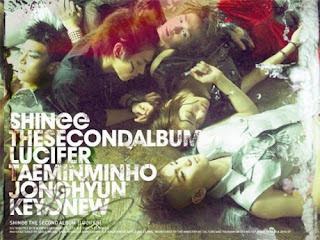 I don't know but SHINee's LUCIFER reminds me of DBSK's Mirotic head on. And, just like how Mirotic showcased Changmin's beauty, Lucifer never failed in displaying Taemin's potential. Keke. The song is solid on its own, but I actually really liked the choreography. Not really my type of boyband, but at least what they're doing is not cookie-cutter (although that "A-Yo" completely steals the Jason DeRulo playbook). you and Nikki will be pleased to know I like this. A LOT!! "A-Yo" is my second favorite song on the album as well.